Makes delicious lettuce wraps. You can also mix in some mayonnaise and make some sandwiches. 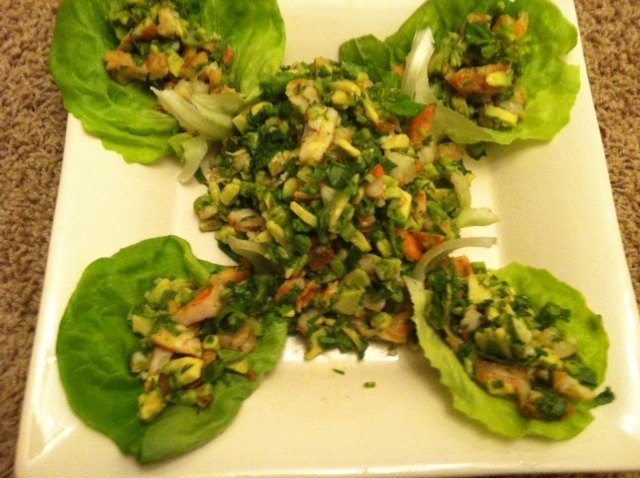 For Serving: Lettuce leaves for lettuce wrap. For sandwiches, mix in some mayonnaise with the salad and stuff into pita pocket bread. Season the shrimp with salt and pepper and grill, or place on hot frying pan [with a little olive oil] until cooked through–make sure you don’t overcook them and dry them out. Keep aside and let cool down. You can also refrigerate if you like. Mix all the other ingredients together [arugula + avocado finely diced +green onions finely+ Jalapeno + cilantro + garlic +1/2 cup of lemon juice+ extra virgin olive oil+ salt to taste]. Add the shrimp and toss well and serve either as salad, lettuce wraps, or mix in some mayonnaise into the salad and make sandwiches with pita bread.